“The mise-en-scène of the picnic with which Powers of Ten begins is of importance, for it presents us with an image that we might locate in a very specific thematic tradition. Certainly the care with which the picnic tableau was constructed is well documented. When we look down, what do we see? The recumbent figure of the man, his hand—which we will shortly plunge into—resting across his chest, some plates, some fruit, a book, and some magazines. Then we see what appears to be an oddly oversized clock (perhaps it is the cover of another book), sliding out from below the volume that sits upon it. Once we notice this, clock faces begin to proliferate: the wristwatch that now seems intentionally turned toward us, and then the plates, with the knives playing the role of chronometer needles […]. The reading matter is suggestive as well. At the top of the frame, to the left of the man’s head, are positioned issues of Scientific American and Science, which—together with the sleeping figure—indicate that we might connect this image to others in which sleeping men are slumped over documents of the work of reason, most obviously “The Sleep of Reason Produces Monsters,” the forty-third plate of Goya’s Los Caprichos. Text: Mark Dorrian, Adventure on the Vertical Cabinet, Issue 44 24 Hours Winter 2011/12. “It was the writer, curator and artist Jeremy Millar who became convinced Smithson knew of Ballard’s short story, The Voices of Time, before building his jetty. All Smithson’s books had been listed after his death in a plane crash in 1973 – and The Voices of Time was among them. The story ends with the scientist Powers building a cement mandala or “gigantic cipher” in the dried-up bed of a salt lake in a place that feels, by description, to be on the very borders of civilisation: a cosmic clock counting down our human time. 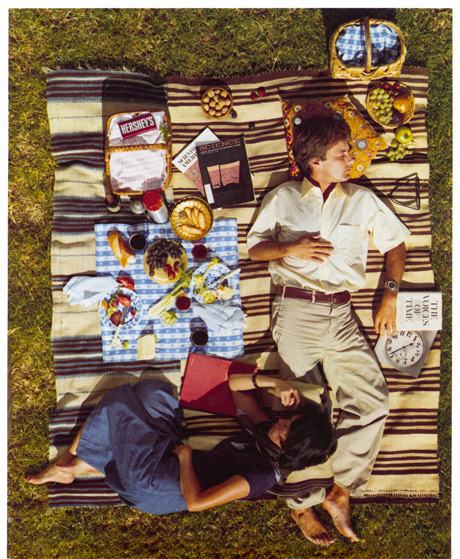 It is no surprise that it is a copy of The Voices of Time that lies beneath the hand of the sleeping man on the picnic rug in the opening scenes of Powers of Ten, Charles and Ray Eames’ classic 1977 film about the relative size of things in the universe. 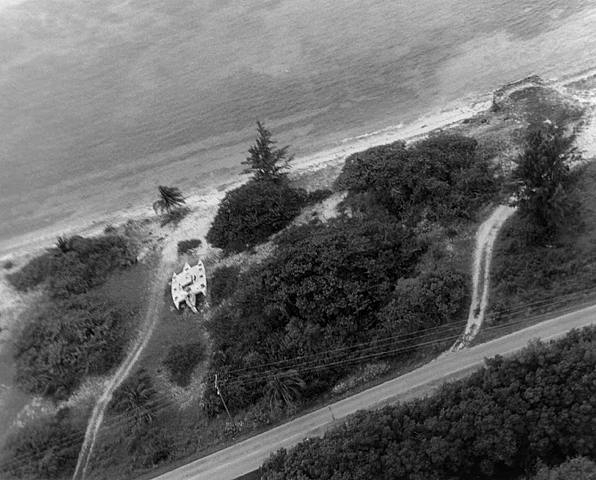 Image: Tacita Dean, Aerial View of Teignmouth Electron, Cayman Brac. 16th September 1998. “Tellingly, the cities that tourists most enjoy are those in long-term decline –Venice, Florence, Paris, London, New York. The last two are gigantic money-mills, churned by a Centurion-card elite who are retreating into gated communities in Surrey and the Upper East Side. Already their immense spending power has distorted social life in London and New York, freezing out the old blue-collar and middle classes, and validating the notion that the dreams that money can buy are a perfectly fit topic for the young painter, novelist and film-maker. It’s not their own ambition that corrupts today’s artists, but the subject matter facing them. “But Shepperton, for what it’s worth, is not suburbia. If it is a suburb of anywhere, it is of London Airport, not London. And that is the clue to my dislike of cities and my admiration for what most people think of as a faceless dead-land of inter-urban sprawl. Hurrying back from Heathrow or a West Country weekend to their ludicrously priced homes in Fulham or Muswell Hill, they carefully avert their gaze from this nightmare terrain of dual carriageways, police cameras, science parks and executive housing, an uncentred realm bereft of civic identity, tradition or human values, a zone fit only for the alienated and footloose, those without past or future. J.G. Ballard, “Welcome to the Virtual City”, Tate, Spring 2001. p 33. 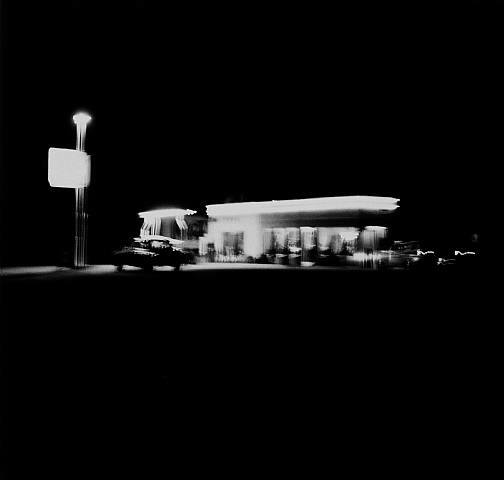 Image: Ed Ruscha, Gasoline Stations, 1989. Planes intersect: on one level, the world of public events, Cape Kennedy and Viet Nam mimetised on billboards. On another level, the immediate personal environment, the volume of space enclosed by my opposed hands, the geometry of my own postures, the time-values contained in this room, the motion-space of highways … On a third level, the inner world of the psyche. Where these planes intersect, images are born. With these co-ordinates, some kind of valid reality begins to clarify itself. Roger Luckhurst, “Decade Studies: The 1960s”, Science Fiction. Cambridge: Polity. 2005. p 149-150. Matt Logue is a Los Angeles based artist, photographer and animator. After working for the Tippett Studio and spending three years in New Zealand on all three Lord of The Rings features, he returned to the US to persue more personal work. 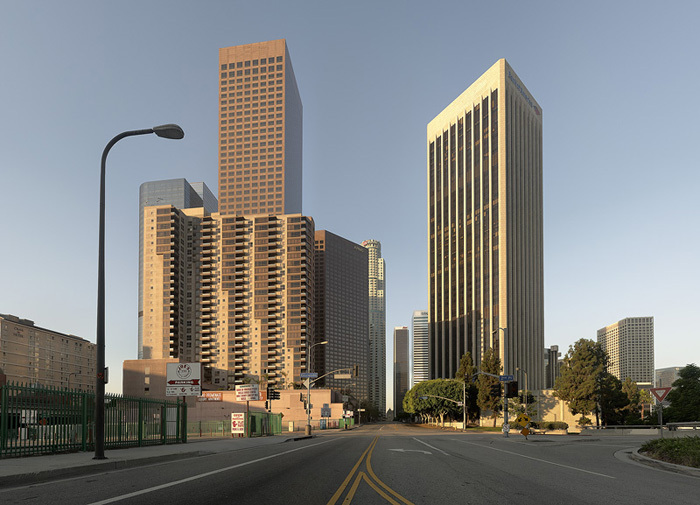 Logue’s Empty LA project is a stunning visualisation of a world emptied of people. Science Fictional: In your Empty LA series you’re presenting a vision of a city that could never be fully experienced. What was your inspiration for the series? Matt Logue: The inspiration for the series came, perhaps predictably, while on the freeway, driving to work. The thoughts that kept coming back was, “How did we get here? Why did we do it like this?” From there, I imagined an empty city, the sounds you would hear in the skyscraper canyons, the animals returning to make their homes in the shelters we’d built. After that, I simply had to see it, I couldn’t not do it, so after working out a technique to do it through trial and error, spend most of my free time for the past four years working on the images. SF: Empty cities, ruins and vacant spaces seem very much in vogue at the moment, what with all the post apocalyptic movies and books like ‘The World Without Us’ – yet they also recall a Romantic vision of the Sublime landscape. What do you suppose the viewer feels when they look at these contemporary images? ML: By far the most common response I’ve gotten from people is “That is so creepy/spooky/unsettling,” followed by “I wish I could experience that.” While seeing each image gradually emerge, I would experience a surprisingly intense feeling of what I can only describe as relief, finally getting to see the empty freeways and downtown. 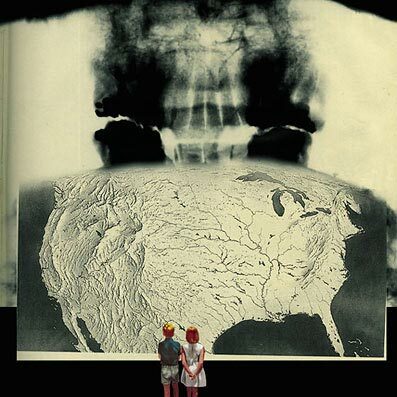 My favorite images from other artists always leave me making up stories in my head or asking questions about the work – not necessarily about the technique, but about the relationships depicted, the evolution of civilization that led to a particular image. The art that keeps me coming back leaves some room for the viewer to participate in it, and I think people feel that with these images. They’re visually striking and I think they also strike an emotional chord with people, especially citizens of L.A.
SF: How do you see your Empty LA work sitting with your other landscape work? The juxtaposition between natural landscapes and the artifice of the empty city work is startling. ML: Empty LA was a departure from my other landscape work. For me, taking photos for the sole purpose of making a beautiful image is becoming more and more difficult – I keep wanting to place my images in the context of humanity and where we’re going or what our possible futures are. Lately I feel like making straight landscape images is like eating dessert three meals of the day – it can be fun, but becomes less and less fulfilling. Which is not to say that I don’t admire landscape photographers, far from it, but I think I trend more towards the school of thought of people like Richard Misrach and Robert Polidori, who make some absolutely stunning images while framing them in the context of the built world rather than just the strictly natural world. 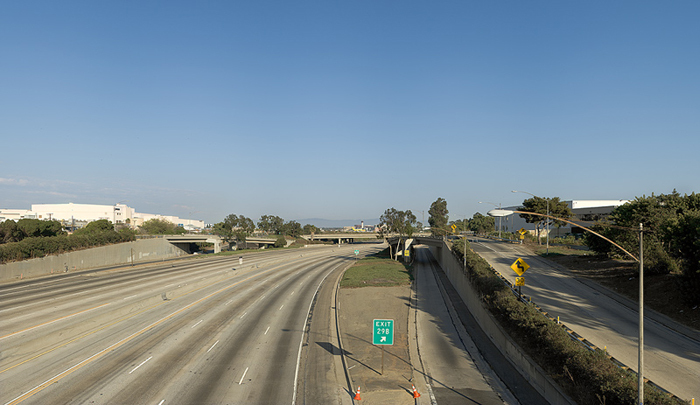 The other way Empty LA was different was that I had a relatively narrow project to work on and could really narrow down my thinking – my landscape work has been mainly done during stolen time when I’m travelling with my family or riding my bike around LA. SF: What did you do with Tippett and Lord of The Rings? Did that experience cross over into your photography work? ML: I started at Tippett as a kind of low-level technician, making mattes for the compositors. I actually applied as an animator, so I came in early every day and worked like a dog to get into the animation department, which finally happened after about a year there. I animated on a few shows and then my wife and I moved to New Zealand, where I was an animator on all three Lord of the Rings films. While working as an animator, we frequently have to make the best of poorly-shot background plates, while making pleasing compositions. I think that daily practice in composition really helps me in my photography, and my photography in turn helps my animation – because I know a lot about traditional and digital photography, I’ve often been called on to do jobs outside of animation at the companies I work for. 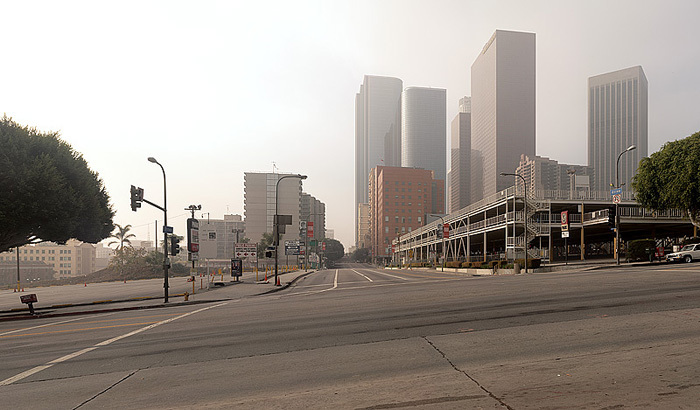 SF: The Empty LA images suggest a post apocalyptic scenario, a sci-fi narrative of some sort, yet at the same time there’s something oddly calming about them. Is there an element of wish fulfillment or fantasy in the images? ML: The post-apocalyptic scenario is something I thought about a lot while working on it, but I left it intentionally vague – I didn’t want it to be too much of a narrative. This goes back to that “leaving space for the viewer” idea – I purposefully didn’t go into why or how humans had disappeared, only that they didn’t exist in this world anymore. Now what? What would happen to the city? For me, and for many other people, it’s very calming to imagine the planet continuing without us – the sun rises and sets, rain falls, animals live and die, all without our intervention. I, probably like many people, would be very interested to see how the world would develop in our absence. Many people have told me they wish they could experience that, to walk the highways from the sea into downtown, but what most interests me is imagining how the planet itself would develop without us. I don’t want to read too much into people’s responses, but I believe there’s another angle to this as well, given the current situation we’re in with the climate and environment. I think there’s an underlying sense of hopelessness in many people about what we as a species have done and are doing to the planet, and underneath that, a feeling of guilt. We’re so entrenched in our way of life that it feels impossible to do what needs to be done in time to keep massive climate change from happening, and seeing the world emptied of people, if only for a few minutes in a series of photographs, gives us a respite from that. SF: Absence is very powerful – your removal of people, cars, aircraft also takes away the point of identification most viewers would have when looking at images of a city. In some ways these images are almost like those classical images of natural landscapes by Ansel Adams. Was that a part of your thinking? ML: I purposefully decided on a more formal approach to this series, to try and stay as anonymous as possible in my viewpoint. I even went so far as to not caption or identify the images – aside from the copyright information and the title page, there’s no text in the book. It’s a way of treating the city that’s been built up over the years as a natural landscape, because in the absence of humans, that’s exactly what it would be. Freeways might become migration routes, office buildings might be enormous bird habitats, and so on. The formal aspect of it also provides a framework for people to hang their own narratives and questions on, as opposed to me dictating people’s individual experiences of the images. SF: Without wanting to lift the veil too much on your process, could you tell us a little about the way the images were made? They seem, online at least, to almost seemless – was that the effect you wanted to achieve? ML: Well, sadly it was never much of a veil – most of the images could only have been done digitally! It’s a curious situation – when people first see it, one of the first questions they ask is, “How did you do it?” To be completely honest, discussing my own techniques quickly becomes tiresome, as people ask what lenses or cameras I used, or what version of Photoshop, etc. Of course, I’d love to know that stuff about other photographers’ work, so I suppose I’m a bit of a hypocrite. The seamless effect was something I was going for, I wanted it to look and feel as natural as possible. In a nutshell, they’re mosaics of anywhere from thirty to well over one hundred images, all taken as close as possible to each other in time, and hand-blended in such a way as to remove the cars and people. I had to work backward from the framing and final print size I wanted and reverse-engineer how and when I was going to take the pictures. Google Street View helped immensely in scouting locations, usually overpasses and pedestrian walkways that didn’t have high protective barriers. “[The] question that should be haunting science fiction is: why did Ballard get it right, while all of the other science fiction writers were getting it wrong? Why did their apparently logical and well-grounded predictions about ongoing advances further and further into space prove to be so flawed? The standard answer of unrepentant space enthusiasts, as I described it in my Locus Online commentary “Tunnel Vision and the Unfarmed Sky,” is that we “have all been betrayed by a short-sighted public, gutless politicians, inept bureaucrats, and—pace Jerry Pournelle—effete academics” whose obdurate myopia and selfishness prevented humans from easily conquering the universe in the manner envisioned by science fiction; but can anybody really continue to believe that it is all a matter of incompetence and villainy after forty years of a stagnant space program? My answer in that essay, and in an earlier 2003 essay about the Columbia disaster which provoked a bit of controversy, is that humanity to date does not have the technology or the resources to master the unexpectedly difficult and expensive task of conquering space, leading to unwise initiatives like the space shuttle program implicitly inspired by the overly optimistic visions of science fiction. Another answer, which I hope to develop in a forthcoming book about space films, is that the observed realities of space travel—astronauts lumbering about in spacesuits through the unprecedentedly lethal vacuum of outer space or upon equally forbidding planetary surfaces—are simply not appealing to most people, diminishing their inclination to support actual space programs and heightening their interest in the far more conventional, and far more attractive, fantasies of unproblematic space travel without any need for spacesuits, as epitomized by the Star Trek and Star Wars franchises. But here, I wish to explore J. G. Ballard’s own, quite different, answers to this question. The Man Who Didn’t Need to Walk on the Moon: J. G. Ballard and “The Vanished Age of Space” by Gary Westfahl, Internet Review of Science Fiction. Image: Robert Rauschenberg, Retroactive I, 1964. Oil and silkscreen ink on canvas, 213.4 x 152.4 cm.